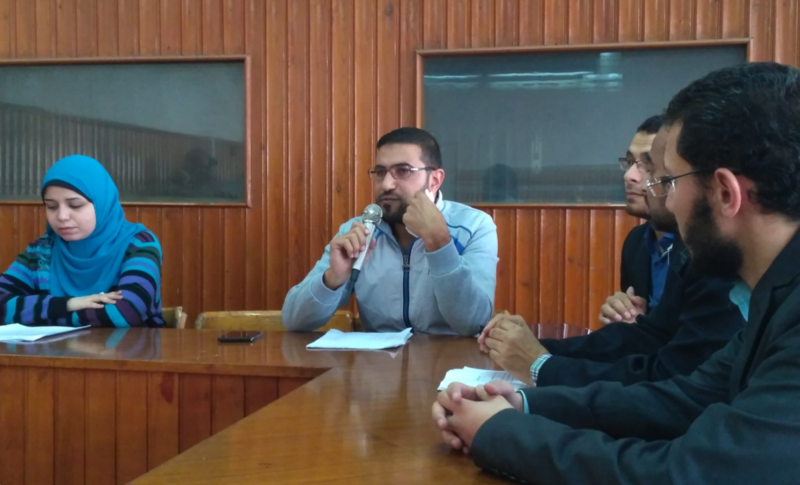 A new session of the joint meetings, organized as part of the collaboration between the University of al-Azhar and the IDEO to discuss the issue of extremism, took place on Monday, November 27, 2017 at the Faculty of Human Sciences (for Women) on the topic of literalism. Three lectures representing both sides were given. Khalil Mahmoud, lecturer in the Department of Islamic Studies of the Faculty of Language and Translation (for Men), began by discussing the characteristic features of the extremist reading of the Qur’anic text, as well as the many interpretations and deviations that might occur from any work that does not take into account exegesis of the All-Wise Qurʾān. He then warned against the ignorance and negligence of some very important elements for understanding the divine message, such as the conceptual and contextual frameworks, in addition to the causes and circumstances of the revelation of the Qurʾānic verses. He also tried to highlight the weakness of a literalist reading of fundamental texts in that there is an absence of a sufficient theory of exegesis. Jean Druel, OP, Director of the IDEO, followed with his talk and approached the subject by beginning from a reading from an article by Gilles Dorival (Professor Emeritus at Aix-Marseille University and Specialist in the History of Biblical Traditions) on biblical interpretation, so as to pose some very important questions: what is meant by “interpretation”? Does the reader intervene or not in the building of meaning? Can he rely on his personal knowledge? Starting from Théagène de Régégium (6th century BC), who was one of the first to ask the question of interpretation in the face of Homeric poetry and propose an allegorical exegesis. These texts contain several meanings: an apparent first meaning and several types of hidden meanings that the reader is invited to build. In the same perspective, and always around the question of the interpretation, Jean Druel, OP mentions the contribution of Philo of Alexandria (1st century AD) for the application of allegorical exegesis to the Bible, an exegesis that made it possible to rid certain difficulties from a literal meaning. Jean Druel, O.P also recalls Cassian‘s thought (5th century) regarding the foundations of Sacred Scripture and the richness of the spiritual doctrine of the four senses (or levels) of reading proposed by Judaism and Christianity: literal, allegorical, tropological and anagogical. He ends his reflection by raising the public’s attention to the following facts: there is no sense independent of the reader. The literal meaning itself is not immediate, it must be constructed, and this requires the deployment of adequate tools and knowledge, constantly taking into account the evolution of words and connotations. These are all things that would make it possible to avoid the impoverishment of meaning and literalism which he describes as the “disease of interpretation”. Miss Merihan Ali, teaching assistant in the Department of French Language, Literature and Interpretation, began her presentation with a definition of the notion of “literalism” and a distinction between the latter and another bordering notion, namely “literality.” She chose to divide her presentation into three parts representing the three fields of application of the notion studied. First, Islamic literalism and doctrine, where she emphasized the importance of critical reading and reasoning (iǧtihād) to find a way of fidelity that is not blind to the evolution of time and to the diversity of societies. Second, literalism and Qurʾānic interpretation, in which she put forth a number of examples of literalist translations of some Qurʾānic verses and Sunna texts, in order to show the detrimental effect any wrong interpretation would have that would aim to issue jurisprudential opinions without possessing the necessary skills. And third, biblical literalism and interpretation, where she highlighted allegory as a process of interpretation of biblical Scripture widely used by Jewish and Christian exegetes over the centuries. She then finished her talk by concluding that even if the truth of the divine Word is absolute, it does not mean that we have access to this truth. It is only by means of an objective reading of the text, which gives rise to a plurality of interpretations and gives way to reason, meditation, and iǧtihād which can free the spirit from divine revelation. The three presentations gave rise to a very rich discussion, during which Professor Roqaya Gabr recalled the importance of the work of grouping and translation done by a group of specialists (exegetes certified by al-Azhar) as part of a project of the Ministry of Waqfs: al-Montakhab, Selection in the Exegesis of the Holy Quran, Arabic-French in 4 volumes. The Higher Council for Islamic Affairs, affiliated with al-Azhar, published the first version of al-Montakhab in 1997. For his part, Rémi Chéno, O.P praised the effort of al-Azhar while drawing attention to the need to respect the openness of a text and to accept the fact that it is open to multiple interpretations. Prof. Sahar Samir Youssef, Head of the French Section, Faculty of Human Sciences (Women).